During our recent trip to Kazakhstan we spent 10 days in the Almaty region and were thoroughly impressed with both the city and the incredible nature surrounding it. It was very different to Kazakhstan's new capital Astana and we enjoyed seeing the contrast. We set ourselves up at a friendly and comfortable hostel and used this as our base for exploring all the things to do in Almaty. The city isn't very big so we got to know our way around pretty quickly. So here is our ultimate city guide to Almaty; everything there is to eat, see and do in Almaty. Language: Kazakh and Russian. Some English spoke in restaurants and by younger people. Some menus in English. Almaty is extremely close to the border of Kyrgyzstan and there are buses and shared taxis to and from Bishkek (capital of Kyrgyzstan) which take around 6-7 hours. Overnight train Astana to Almaty. 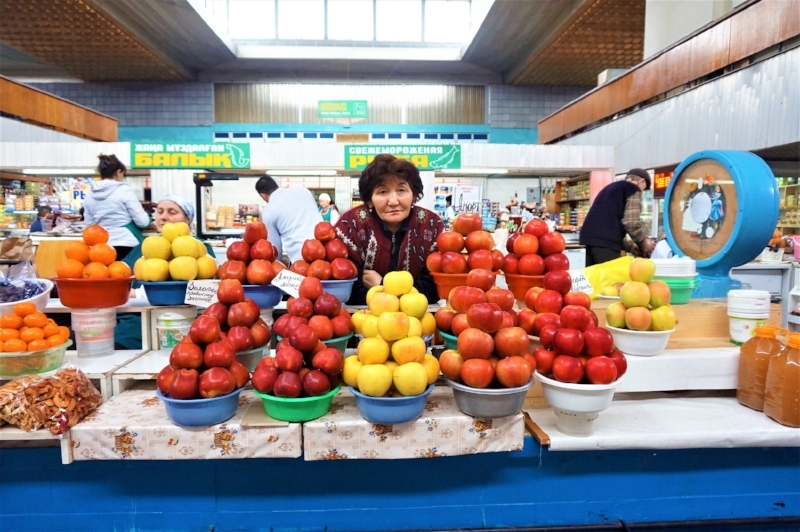 Ultimate Almaty City Guide. We arrived by train from Astana. There are a range of overnight and long distance trains which take around 14 hours. There is also a small international airport with regular flights from Europe and Asia. We had a great stay at Amigo Hostel Almaty. The room was big and comfortable and the staff spoke some of the best English we experienced in Kazakhstan so they were great for helping organise things. There are lots of restaurants, a supermarket and the metro all within easy walking distance. There is a good couchsurfing community and a variety of other hostels and hotels on bookings.com. Most accommodation is very affordable and within a reasonable distance of the city centre. 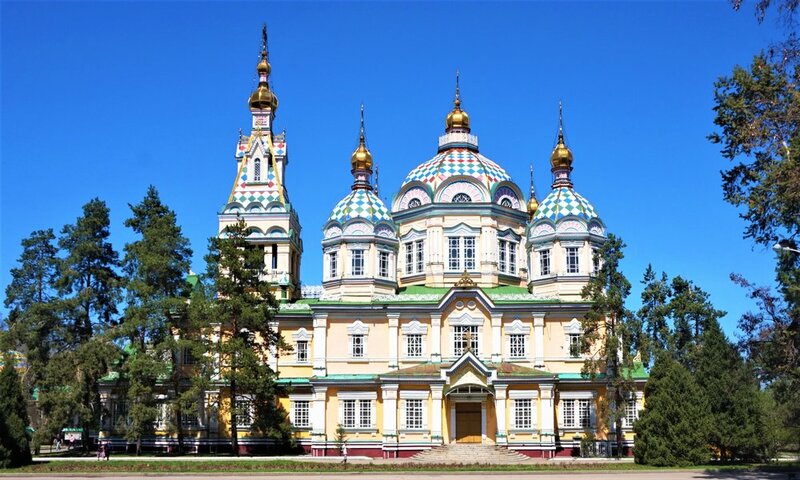 Visiting the Zenkov Cathedral is definitely one of the best things to do in Almaty. This is the most well-known attraction in Almaty. The park is a memorial to Almaty soldiers who died in WWII. The centre piece of the park is the stunning Zenkov Cathdral which is made entirely of wood, including the nails! Entrance to the church is free. On a sunny day it is busy with local life and makes a great place for a wander. Medeu is the highest ice skating rink in the world and is a busy place to be year round. It can be easily reached by taxi or bus #12 which leaves from opposite the Kazakhstan Hotel. In summer the rink is closed but the surrounding area is great for hiking and getting out the city for the day. Gondolas also go from just below the rink to the ski fields. We didn't do this but the views would have been stunning and people were enjoying a day of skiing in t-shirts in April! In winter you can hire skates or watch one of the many events which take place in this arena. Info and pricing can be found on their website. This is a maze of shops selling everything from clothing and pots to jewellery and fruit. This was one of the few places in the city that we found souvenirs but even if you aren't looking to buy anything this is an interesting place to get lost and people watch. There are some excellent little canteens located around the market which sell cheap, local food. Kok Tobe is the highest point in Almaty and you can get there by gondola, taxi or bus followed by a shuttle. We took the gondola up which was 1000 KZT per person, one way. At the top is a small park which features amusement rides, cafes and a small zoo. The views of Almaty are brilliant, with the snow-capped mountains to one side and the city out to the other. Apparently sunset is a good time to go but we were hungry so we left earlier! We were there at the start of spring, just as the flowers were popping up. Given another couple of weeks this park would have been really beautiful. Popular with locals and visitors, it's a lovely place to relax and enjoy the sun. We were lucky enough to have great weather most of the time in Almaty. But had we not we might have tried one of the museums in the city. The three most popular are The Central State Museum of Kazakhstan, The Museum of Kazakh Musical Instruments and The A. Kasteyev State Museum of Arts. As budget travellers we are always looking out for affordable, authentic, delicious food. We really enjoyed the mix of Asian and Russian cuisine in Almaty from dumplings and noodles to blini and borsch. We frequented Kafahat (see the sign in the picture), a canteen style restaurant where you grab a tray, point at anything and everything you want to try and pay before you sit down. These are located everywhere in the city (we saw at least six) and are very cheap, we averaged around €4 for two meals and drinks. There are an abundance of small bakeries selling various pastries filled with meat, cheese, spinach etc. Each costs around 80c and makes a great, cheap lunch on the go! Our favourite Kazakh foods were Manty (Kazakh dumplings) and a noodle dish made from thick, round noodles with a variety of vegetables and beef. Horse meat is popular too. Wow, who would have thought that coffee would be such a key feature of a trip to Kazakhstan?! Every cafe we walked into in Almaty was gorgeously decorated and served amazing barista coffee. It wasn't cheap (around €3-4 for a cappuccino) but it was well worth it and soon became a much-anticipated part of our days. We enjoyed great selections of snacks and cakes too. Make sure you go to the toilet at these places too as the bathrooms are just as gorgeous and the exteriors. Our favourites were Honest Coffee, Aroma, United Coffee and Sova (owl) Coffee. Almaty has very cheap public transport. The metro system is clean and easy to use with signs in English. It costs 80 KZT (around 25c) per journey and trains come every 10 minutes. There is only one line but it takes you all through the city. There is also a complex but extensive bus system in Almaty. We only used this once or twice as the metro took us most places we needed and was a little more user-friendly. But at 25c you can give it a go and reach almost anywhere in the city. For detailed information about routes and stops check out this helpful website. Almost every car in Almaty will become a taxi if it's heading in your direction, just stick your hand on the side of the road and negotiate a price. This can be quite complicated if, like us, you speak no Kazakh or Russian. We used Uber and found it very cheap and easy. Almaty is located in a crazily beautiful part of the country. Within a few hours you can be skiing, hiking in a canyon or enjoying stunning lakeside views. We spent a couple of days outside of the city enjoying these sites. Having never visited a canyon before, I really enjoyed this trip. The views are stunning and the walk through the canyon is an easy-going hours walk. You end up at a river and a yurt camp where you can stay for the night and enjoy amazing views of the stars. Getting to Charyn Canyon alone can be difficult. We went here with a tour from our hostel but you can also arrange your own transport or try hitchhiking. We paid 3,500 KZT per person including park entrance fees, just to give you a ball park figure. The entrance to the canyon is about a 3-4 hour drive from the city. It's on the way to the Kolsai lakes so in hindsight we would have combined these two trips. This is a really stunning national park with some amazing hikes. In summer it's a popular destination with homestays and a yurt camp by the first lake. You can reach the park by tour or shared taxis and hitchhiking from Almaty. Getting to Kolsai in the off-season is a little more difficult but still doable. We didn't end up going here because we went to the Kolsai Lakes instead. But this lake is also meant to be spectacular and a little easier to get to. Just an hours drive from Almaty, it can easily be enjoyed as a day trip. There are lots of things to do in Almaty and the surrounding region and they are well worth exploring for at least a week or two. In April the weather was warm and comfortable. It would be great to go back in summer when everything is a little greener! If you are heading to Almaty and have any questions feel free to get in touch!